For the past four years, I have been part of a very special team at Compassion. One of my volunteer roles has been to manage the Compassion Pinterest account and write some of the blog posts for Compassion's Second Friday Letter Writing Club. As part of this team, I have had the opportunity to work with some great people at Compassion! Chris, Jacquie, Sam, Eryn, Susan, Emily, and Sarah have included me in conference calls, Google Hangouts, and numerous emails over the years, listening to my ideas and truly making me feel like part of the team. But as new volunteer opportunities have come along for me, I have felt that my time in this role needed to come to an end. I sent an email to the team a couple of weeks ago to let them know about my decision. They graciously accepted my 'resignation' and wished me the best of luck in whatever the future holds. In fact, they almost made me rethink my decision! So Friday, when I arrived home, there was a package on the table from Compassion. Now this isn't usually a strange thing. 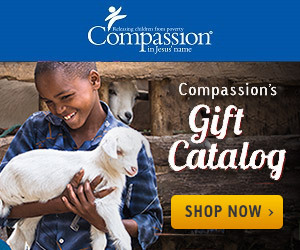 I had just placed an order to have child packets delivered for an upcoming conference where I will have a Compassion table. But the strange thing about this particular box, it was really light and a bit larger than the usual boxes that arrive. When I opened the box, there was a card with my name on it taped to something wrapped in tissue paper. I opened the card and started reading it, that is when I started to cry. The card was signed by all the members of the social media team at Compassion that I have had a chance to 'work' with. Their very kind words truly made me feel loved! This very special team of people had a canvas created for me of Skippy (the official, or is it unofficial, mascot of Compassion) with images from many of the Second Friday Letter Writing Club board posts I wrote for the Compassion blog! The past four years has been filled with creating new boards, deleting boards, following people, adding new pins, putting together letter writing posts, and most importantly, helping to share about the children who are still waiting for sponsors. Just because my time helping with the Compassion Pinterest account is coming to a close, does not mean that my volunteer time with Compassion is done. This ministry is one that I love and will continue to serve with, even if they do make me cry! Thank you Chris, Jacquie, Sam, Eryn, Susan, Emily, and Sarah for allowing me to be a part of the team!